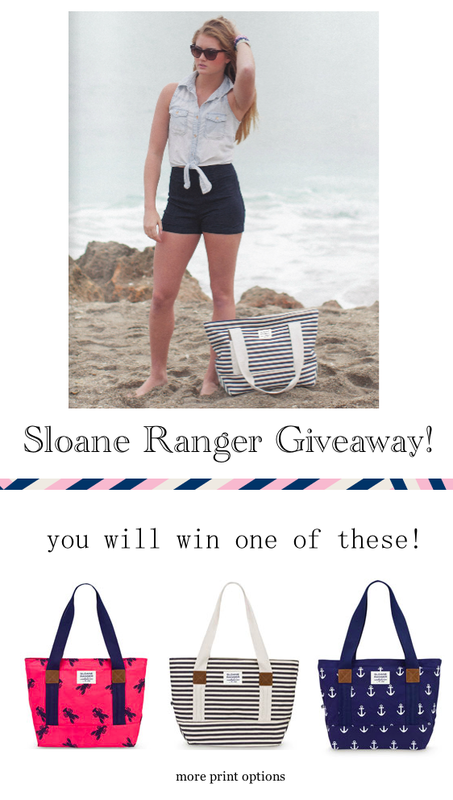 I've teamed up with Sloane Ranger for a Spring giveaway! I love their totes for the summer because of the prints and the durability of the bags. Lucky for you, one of you is going to win a printed tote bag in the print of your choice! All you need to do is fill out the Rafflecopter widget below and you are all set! What a great giveaway! I love all the prints, it would be hard to choose! Loving the anchor print right now. Love those bags! They are so cute. Especially the lobster print one! Perfect for summer. I love the anchor print bag! So cute!!! Btw, I really love your blog. Thank you! I see that you are from Japan- so thrilled that I have readers from all over the world! I hope that you enjoy the blog!! I have a true and deep love of anchors, but that lobster print is to die for. I would choose the anchor print! Tough choice! I think I would go with the stripes with the anchors in a very close second. Actually, you could probably ask me tomorrow and I would switch them! I would absolutely choose the stripes! Thank you! If I were to win the contest I would definitely pick the striped tote. I like all of the above, but that one is definitely the most versatile, and with everything I carry around with me 24/7, I need a big, versatile bag desperately! Having a versatile bag is a must-have! I hope you enjoy the blog, and keep on reading! Good luck on the giveaway! I love to see Sloane Ranger on blogs! I'm a campus ambassador with Sloane Ranger and really love the brand. I have the anchor tote and adore it - anchors on everything for me, please! Always! Good luck and I hope you continue to read my blog! Sloane Ranger has the market on the perfect throw in the back seat weekend getaway bag! Hope I win! i'd love the anchor print!! Oh alright! Didn't get any email so I guess I didn't win haha! Anyway, I LOVE the look of your blog! So sorry you didn't win! There will be more giveaways and discount code in the future! I hope you continue to read!